Two University of Nebraska-Lincoln mathematicians have been chosen as fellows of the American Mathematical Society. 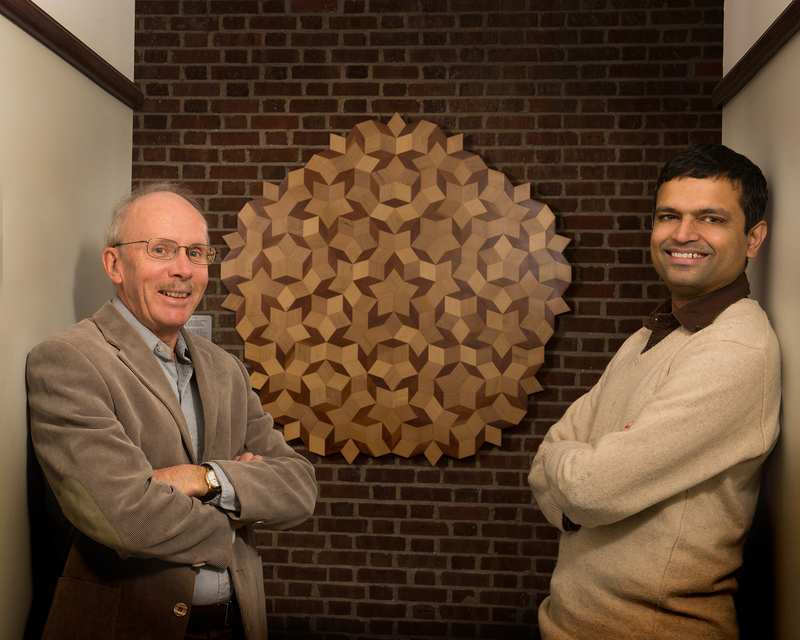 UNL's John Meakin, Milton Mohr Professor of Mathematics, and Srikanth B. Iyengar, Willa Cather Professor of Mathematics, have joined the esteemed group of mathematicians from across the world, including five fellows from UNL inducted in 2012, the first year of the award. The AMS fellows program recognizes those who have made outstanding contributions to the creation, exposition, advancement, communication and utilization of mathematics. Iyengar and Meakin are among 50 mathematicians who were elected fellows this year. Meakin, who was chair of the mathematics department from 2003 to 2011, was inducted for contributions to semigroup theory and for his exemplary service as department chair. He said it was gratifying to be recognized by his peers and to receive an acknowledgement of contributions to the profession. Meakin has focused on algorithmic problems in semigroup theory and connections between semigroups and other areas of mathematics and theoretical computer science -- particularly geometric group theory, automata theory, formal language theory, topology, geometry and mathematical logic. He is known for his work with Stuart Margolis and several students in initiating the development of the combinatorial theory of inverse semigroups. Recently, he also was awarded a Fulbright Scholarship to conduct research and teach in India. He also was recognized for the department's accomplishments. The AMS recognized the department in 2009 as an Exemplary Program or Achievement in a Mathematics Department. "We've long held a balanced view toward our research, education and outreach missions, and we've expanded on that," Meakin said. The AMS recognized Iyengar for his contributions to commutative algebra, representation theory, homotopy theory and algebraic geometry. His prolific research career has focused on taking ideas from homotopy theory to solve problems in commutative algebra, in collaboration with fellow AMS fellow Luchezar Avramov of UNL. Iyengar also has used his expertise in commutative algebra on other areas of mathematics. He's collaborated with researchers from the University of Notre Dame; the University of Sheffield and the University of Aberdeen in the U.K,; and Bielefeld University in Germany. "Nebraska has had a long tradition of strong researchers in my area," he said. "And working with Avarmov has been extremely fruitful. We have more than 20 joint publications and continue to work together." Iyengar has published more than 50 papers and received a Simons Foundation Fellowship that allowed him to spend the 2012-13 academic year at the Mathematical Sciences Research Institute at the University of California, Berkeley, where he was one of the organizers of a Special Year in Commutative Algebra. He is also the principal investigator on a National Science Foundation grant that will run through 2017. Iyengar said he was thankful for the support of his colleagues. "It's an award from the entire mathematical community. It's good to know that the community values the work you're doing," he said. The first class of AMS fellows included five current UNL faculty: Luchezar Avramov, Dale M. Jensen Chair of Mathematics; Jim Lewis, Aaron Douglas Professor and Director of the Center for Science, Mathematics and Computer Education; Judy Walker, Aaron Douglas Professor and chair of the Department of Mathematics; Roger Wiegand, Willa Cather Professor Emeritus of Mathematics; and Sylvia Wiegand, Professor Emerita of Mathematics.